So the amount of excitement I feel for these glitter covered hangers is a little ridiculous. 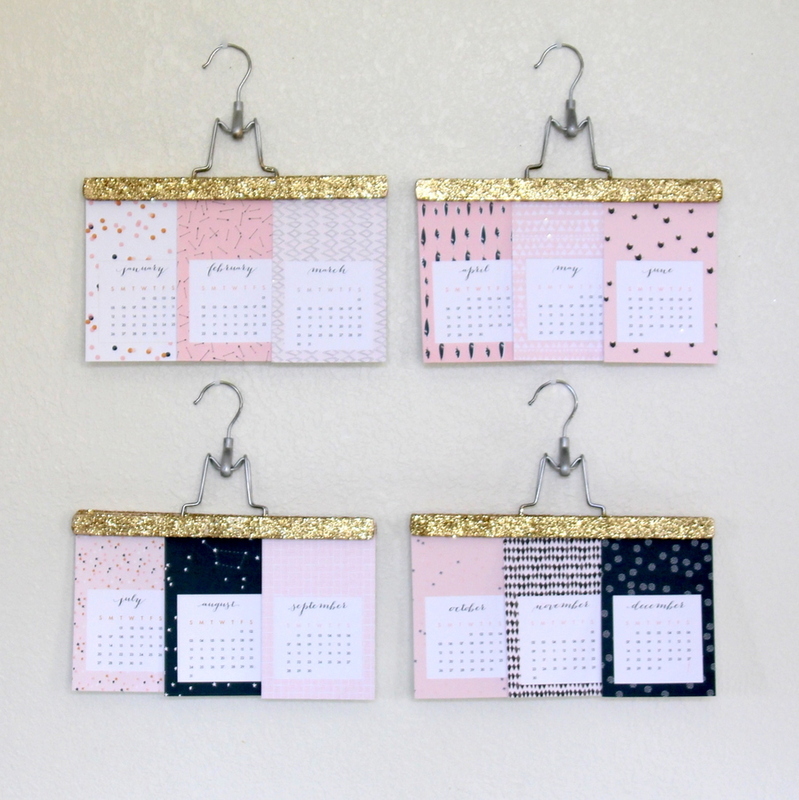 They are literally the perfect art hangers for a studio/craft room/sewing room (we use these terms interchangeably around here- haha). I can’t help my ridiculous love, though! 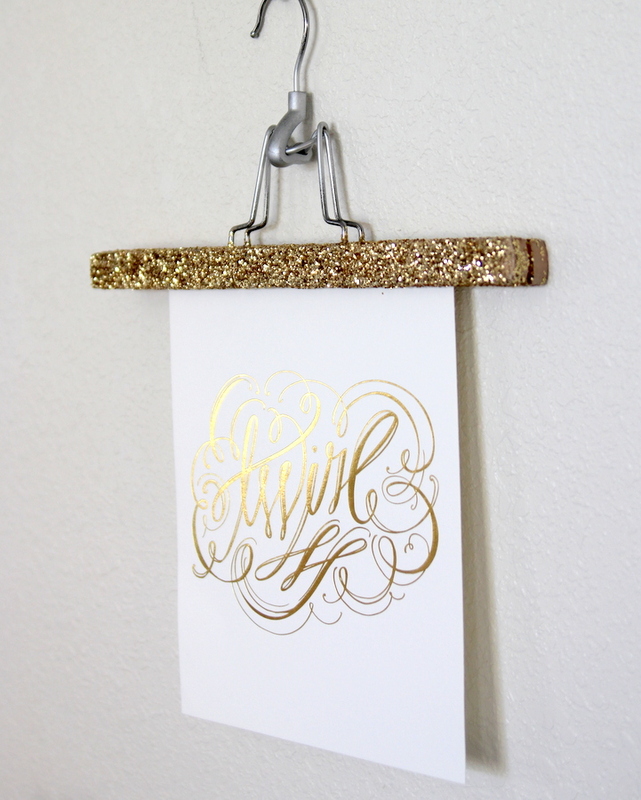 Every time I see them, in all of their glitter-y, art-hanging glory, I fall in love all over again. 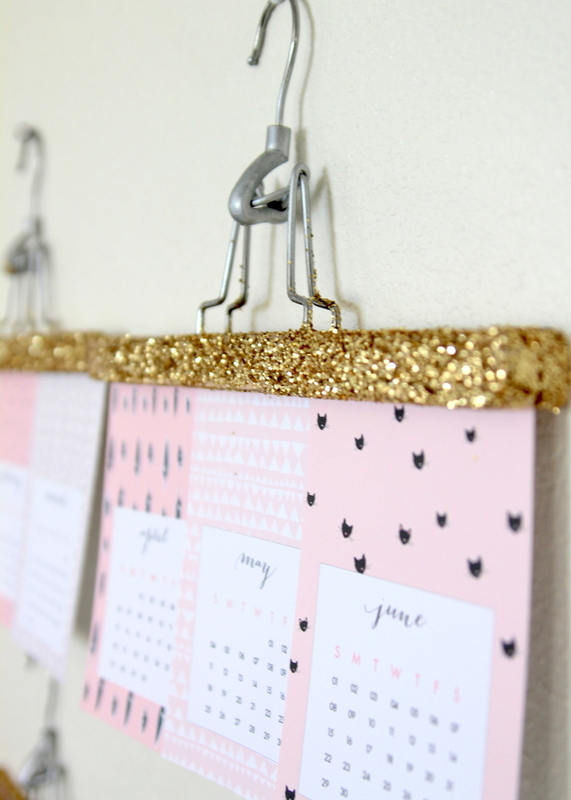 I can’t find my inspiration source photo- I remember seeing these gorgeous glittery hangers as part of a baby nursery a long time ago (pre-pinterest, even!) and have wanted to make some of my own ever since. 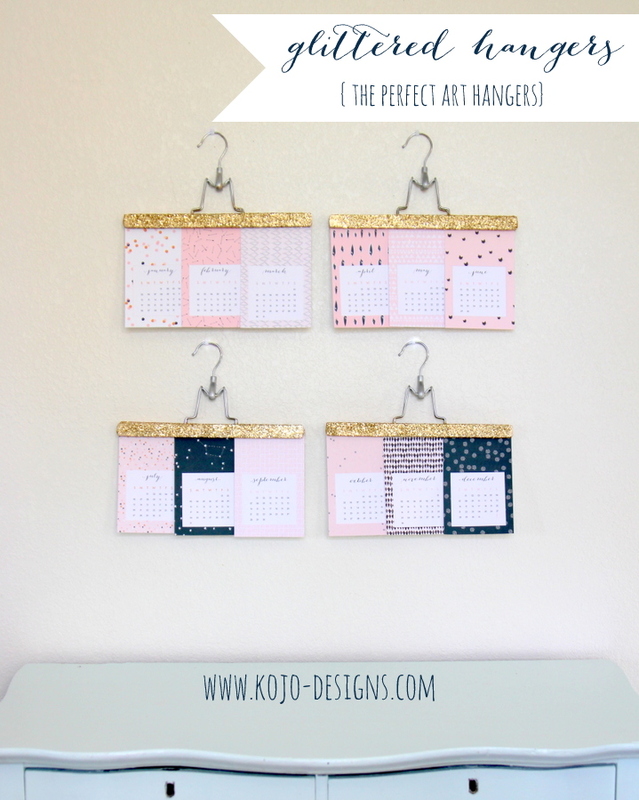 And aren’t those month by month 2014 calendar prints fabulous as well? 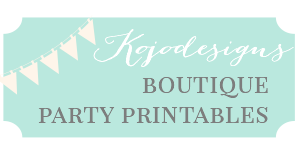 They’re a free printable by Oh the lovely things (I. love. them.). Even better, the glittery hangers are so easy to put together (always a huge bonus). 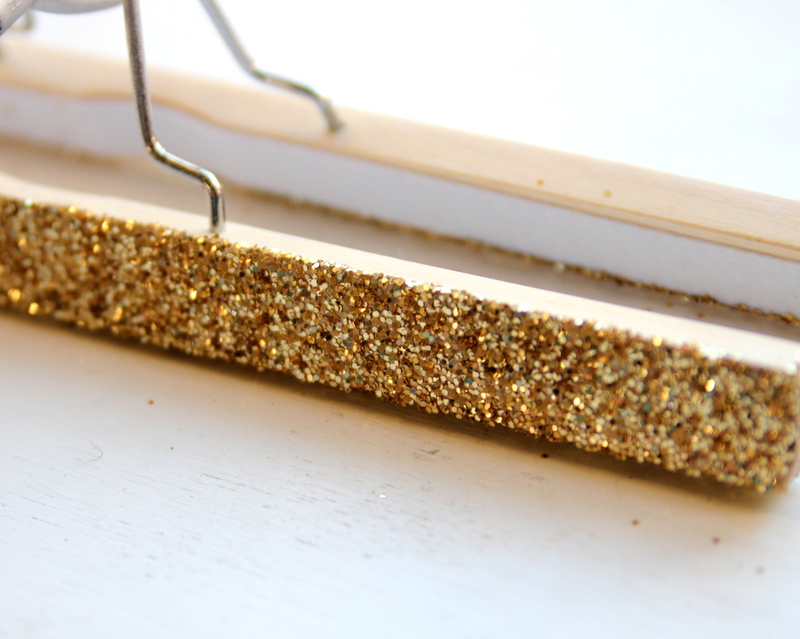 I used these pants hangers from IKEA, spray painted the top part silver (so the black part wouldn’t stand out too much), brushed gold metallic paint on the wood and sprinkled glitter onto the wet paint. Then, after allowing the paint/glitter to dry, I covered the glitter with clear glossy spray paint (to prevent a glitter shower whenever I add new art work). Yessssss! These are awesome, Kirstin! Glitter ALL the things!!!! LOVE! But how did you keep the glitter from going everywhere? Hey tess! Do you mean how did I contain the glitter when I was making them (I didn’t really- I just did the whole process over a poster board to collect the glitter shower)? Or how does the glitter stay now? For that, I sprayed the whole thing with clear gloss spray paint- keeps the glitter stuck and keeps my stuff from getting all glittery every time I change the art work. I love the glitter hangers. Great idea. LOVE it (and the story behind it)!